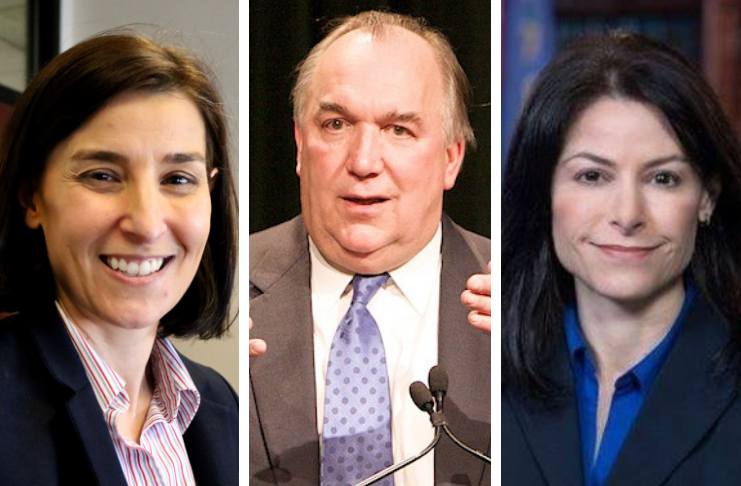 Nessel and Assistant Attorney General Christina Grossi were elaborating at a joint roundtable with reporters on their decision to cancel a planned interview with former interim Michigan State University President John Engler as part of the Dr. Larry Nassar investigation. Both defended against charges of bias and “politicization” from Engler’s attorney, Seth Waxman of Dickinson Wright, who demanded Grossi* recuse herself. Grossi, the project manager for the Nassar investigation, pointed out that she had worked under Bill Forsyth, the independent special counsel appointed by Republican former Attorney General Bill Schuette to investigate the matter. She said that Schuette had tapped her for the case. “My interest is in ensuring that we figure out what happened with Larry Nassar, and I am an MSU grad,” Grossi said. The attorney general’s office canceled a planned Washington, D.C., interview with Engler, the former GOP governor, after a report of his appearances at several recent MSU men’s basketball games. According to the attorney general’s office, Engler and his representation had assured them he would not be available for an interview in Michigan. “It’s important to me. Sexual assault is something I think should be taken seriously. I don’t understand how somebody can say that that’s political. That should be everyone’s interest, regardless of your political association,” Grossi said. Waxman advised Grossi in a letter published this week by the Detroit Free Press that unless she recused herself from the investigation he would recommend that Engler not participate in an interview. “I can’t think of a set of circumstances where anyone has said, you know, ‘I don’t like you, and so I am insisting that you be recused,’” said Nessel. Grossi also elaborated on the reason for her decision to cancel the previously scheduled March 28 interview with Engler in Washington. She stated her belief that Engler’s camp had purposely misled the attorney general’s office in saying he would not be available for an interview in either Michigan or Virginia, where Engler resides. Both states carry harsher penalties for lying to law enforcement than in D.C.
“I try to keep an eye on the news, and I noticed that on Twitter [that Engler] had been at an MSU basketball game [in February],” Grossi said. Grossi said today that she confirmed that agreement in several conversations, both in person and over the phone. Waxman did not respond to a request for comment from the Advance on Friday. Grossi also noted that MSU is “exploring ways… to kind of help us ensure [Engler’s] cooperation,” referring to a clause in the former governor’s employment contract with the university that allows them to compel his participation in the probe. When asked on Friday if a subpoena would be forthcoming, absent Engler’s cooperation, Nessel’s response was terse. Advance Editor Susan J. Demas contributed to this story.